News, events, articles, and other information relating to the Mid-Atlantic region of the US. 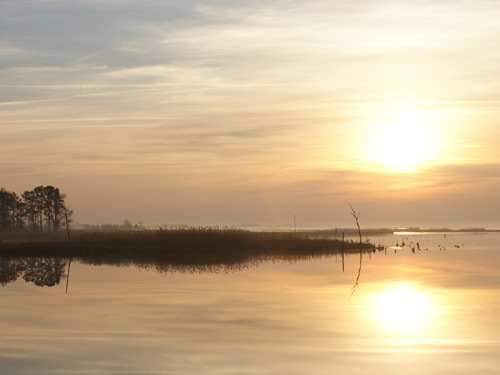 The Chesapeake Bay Foundation's (CBF) biennial State of the Bay Report score decreased one point to 33, equivalent to a D+. The lower score for 2018 was due mainly to increased pollution and poor water clarity caused by record regional rainfall. "The good news is that scientists are pointing to evidence of the Bay's increased resiliency and ability to withstand, and recover from, these severe weather events. And this resiliency is a direct result of the pollution reductions achieved to date. In addition, we did see increases in scores for dissolved oxygen and Bay grasses since 2016, but the recovery is still fragile," said CBF's Director of Science and Agricultural Policy Beth McGee. Established in 1998, CBF's State of the Bay Report is a comprehensive measure of the Bay's health. CBF scientists compile and examine the best available data and information for 13 indicators in three categories: pollution, habitat, and fisheries. CBF scientists assign each indicator an index score from 1-100. Taken together, these indicators offer an overall assessment of Bay health. Dissolved oxygen and bay grasses improved. In the pollution category, toxics were unchanged, while water clarity, and nitrogen and phosphorus pollution were worse. In the habitat category, scores for bay grasses and resource lands improved, and buffers and wetlands remained the same. In the fisheries category, scores for oysters, crabs, and rockfish remained the same, while the score for shad declined. This year's score is still far short of the goal to reach 40 by 2025 and ultimately a 70, which would represent a saved Bay. The unspoiled Bay ecosystem described by Captain John Smith in the 1600s, with its extensive forests and wetlands, clear water, abundant fish and oysters, and lush growths of submerged vegetation serves as the theoretical benchmark and would rate a 100 on CBF's scale. In November, 2018, the U.S. Environmental Protection Agency (EPA) announced funding for three clean diesel projects totaling $4.7 million. The grants are part of an effort to reduce air pollution from aging diesel engines in the Mid-Atlantic region. The funding will go to the Maryland Environmental Service (MES), the Mid-Atlantic Regional Air Management Association (MARAMA), and the Metropolitan Washington Council of Governments (WashCOG). EPA’s Clean Diesel Program provides support for projects that protect human health and improve air quality by reducing harmful emissions from diesel engines. This program includes grants and rebates funded under the Diesel Emissions Reduction Act (DERA). DERA funding has supported nearly 25,000 cleaner buses across the country for America’s schoolchildren. Cumulatively, this funding will result in overall lifetime emissions reductions of more than 1,013 tons of ozone-forming oxides of nitrogen (NOx): 58.7 tons of particulate matter (PM); more than 240 tons of carbon monoxide (CO): 724 tons of carbon dioxide (CO2); and, will save more than 91,000 gallons of fuel. EPA will provide $2.5 million to the port of Baltimore to assist MES in its efforts to reduce diesel emissions and exposure at the port. This project will replace or repower cargo handling equipment and drayage trucks, as well as marine engines on the pleasure vessel, The Spirit of Baltimore, which will improve air quality by reducing harmful emissions by 37 tons of PM, 398 tons of NOx, 165 tons of CO, and 724 tons of CO2, as well as saving 64,450 gallons of fuel. The agency will provide MARAMA with more than $1.3 million to provide incentives to dray truck owners serving the ports and railyards of Philadelphia, Pennsylvania, and Wilmington, Delaware for voluntary early replacement of 40 drayage trucks with older (1997 – 2006) engines. Replacement trucks will have model year 2013 or newer engines with the latest particulate and NOx reducing technology. This initiative will reduce emissions by 197 tons of NOx, 11.5 tons of PM, 75 tons of CO, as well as air toxics in areas that are not currently attaining federal health-based air quality standards. EPA will provide WashCOG with $882,000 to partially fund the re-powering of four diesel propulsion engines and four auxiliary engines on two marine passenger vessels. These vessels are currently operating on the Potomac River in Washington, DC and surrounding communities in Maryland and Virginia. The retrofits will result in reductions of 418 tons of NOx, and 10 tons of PM. For more information about the DERA program, visit www.epa.gov/cleandiesel. The Mid Atlantic Region could experience a mild, wet winter this year, according to NOAA’s Climate Prediction Center. The Mid-Atlantic has an equal chance for below-, near- or above-average temperatures. Better-than-average conditions for precipitation are possible in the Mid-Atlantic this winter. NOAA’s seasonal outlooks give the likelihood that temperatures and precipitation will be above-, near- or below-average, and how drought conditions are expected to change, but the outlook does not project seasonal snowfall accumulations. Snow forecasts are generally not predictable more than a week in advance. Even during a warmer-than-average winter, periods of cold temperatures and snowfall are still likely to occur. NOAA’s Climate Prediction Center updates the three-month outlook each month. NOAA produces seasonal outlooks to help communities prepare for what is likely to come in the next few months and minimize weather's impacts on lives and livelihoods. March 4-10, 2018 is Severe Weather Preparedness Week in North Carolina. During the event, the National Weather Service and the North Carolina Department of Public Safety will implement a severe weather safety campaign to all of North Carolina’s residents. This year's North Carolina Severe Weather Preparedness Week will combine multiple awareness weeks while focusing on tornadoes, large hail, lightning, flash flooding, and damaging straight-line winds. On Mar. 4, 2018, the U.S. Coast Guard issued a warning to mariners of navigation hazards after about 70 cargo containers fell off of a cargo ship about 17 miles off Oregon Inlet, North Carolina. On Saturday night March 3rd, 2018, the cargo ship Maersk Shanghai contacted watchstanders at Sector North Carolina’s command center via VHF-FM marine radio channel 16, notifying them that they lost approximately 70 to 73 cargo containers due to high winds and heavy seas.